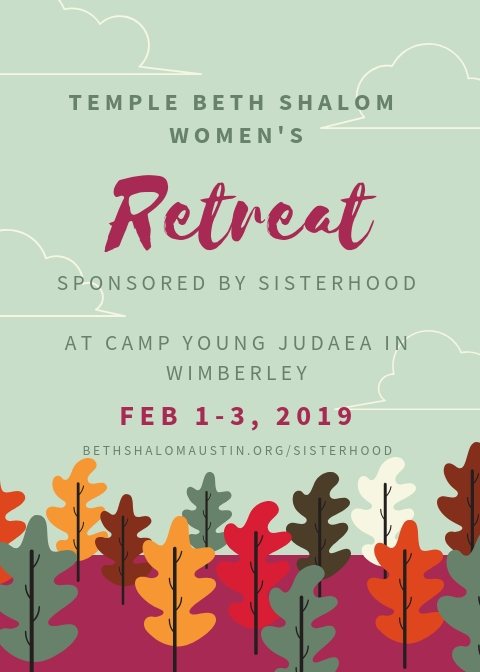 Please join us for the 2019 annual TBS Women's Retreat in Wimberley, Texas, at Camp Young Judea. This is a wonderful time to get together in a relaxed environment, hanging out with friends and getting to know new people. You just have to join us, no membership required of either Temple Beth Shalom or Temple Beth Shalom Sisterhood. This year's theme, Back to Our Roots, will inspire us to learn, contemplate and remember! Cabins $170. Includes linens & towels. Cabins accommodate 8 (lower bunks)- note bunkmates preference, please. Saturday only $50 including lunch and dinner. We love day trippers! OR - Send a check payable to Temple Beth Shalom Sisterhood to Jenny Corman, 2801 Silverleaf Circle, Austin, Texas 78757. Payment is non-refundable. We want everyone to attend, so if the cost is a hindrance please contact Rabbi Amy Cohen at rabbi.cohen@bethshalomaustin.org. Taking care of your finances--Women Finding Financial Shalom. Join Dr. Anne Corn in a discussion of how we as women can be confident in our financial health and knowledge. Join us in Wimberley for lunch and shopping. Please RSVP if you would like to attend--we're making reservations! If you have any questions, please contact Lori Freedman at lorikfreedman@gmail.com or Dena Altfeld at dma3622@gmail.com.